Tuesday, October 16, Cutthroat, a Journal of the Arts will be hosting a reading of Truth to Power: Writers Respond to the Rhetoric of Hate and Fear as well as a silent auction. The event will be held at Mission Gardens in Tuscan. READERS: Karen Brennan, Cynthia Hogue, Tyler Meier, William Pitt Root, Peggy Shumaker, and Pamela Uschuk (BEI Fellow). 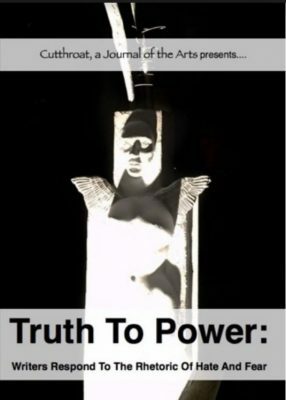 Copies of Truth to Power and Cutthroat 23 will be on sale. A silent auction of artworks by local artists, photographers, and writers. All profits go to Cutthroat, an independent literary magazine in business for 14 years in the Southwest. All editors and staff are unpaid. Cutthroat donates profits to such organizations as the ACLU, Standing Rock Sioux Water Protectors, Friends of the Earth, Southern Poverty Law Center, International Immigration Law Center, etc. Check out Cutthroat here!. If you are in the Tuscan area, go out and support Cutthroat and Pam Uschuk.